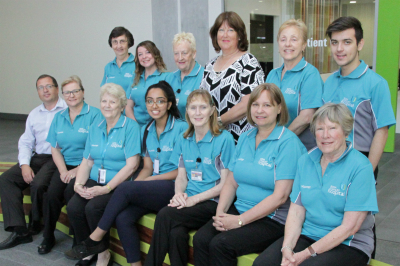 Fiona Stanley Hospital's volunteer program was developed in line with our hospital’s guiding principle of being patient-centric, and complements the design of the hospital, which was constructed to have a healing and therapeutic effect on patients. Our volunteers support the mission and values of South Metropolitan Health Service (external site) while benefitting the local community and providing a meaningful and fulfilling role for volunteers. Working closely with hospital employees, volunteers at FSH provide a suite of services to both patients and visitors, to enhance their stay in our hospital and assist patients in their recovery.